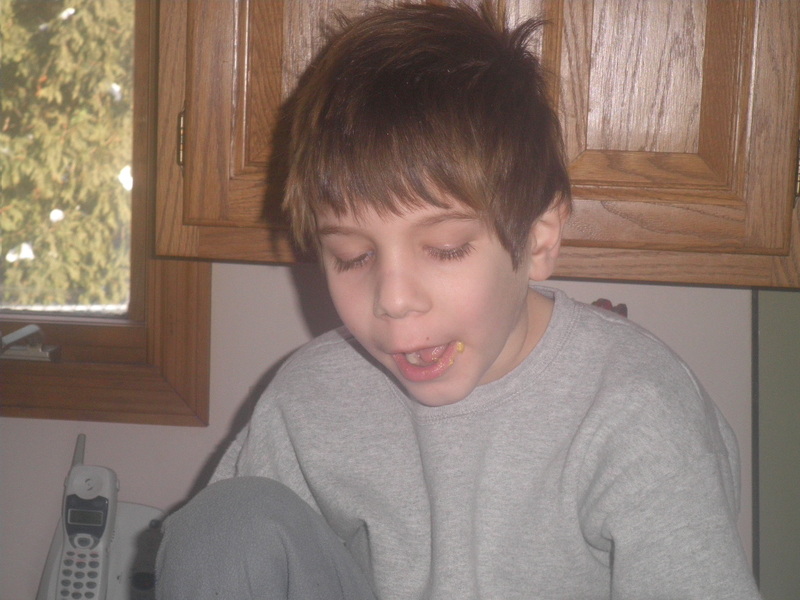 Here he is, pre-haircut, eating egg & toast (one of his new favorite food requests) at grandma’s house. So we tell him we’re going to the mall. When we arrive, the escalator isn’t working and they’ve blocked off the mall entrance to one of the two last remaining magnet stores because the mall proper is kept so cold that the employees of the store can’t stand it, and I’m thinking how much longer before this place goes under? Is it just a mafia money-laundering machine? I certainly can’t envision any way in hell the mall is operating in the black, but our mission is to get our kid a haircut, so I cease my mafia fantasies and we proceed past the freezing cold mall-walkers and into the haircut place, which is the most crowded area in the entire mall. M and I took Jonah here once before and Jonah remembers everything – he plunks himself right down in the same chair he sat in last time, and straightaway eyes the candy machine where we’d fed quarters into it to procure handfuls of colorful stale skittles with which to distract him. That time he was first in line, however, and this time we’re third in line. It’s not a long wait but any wait starts the time-bomb ticking for Jonah Russ. So when we’re called in it’s to a different chair, and Andy immediately announces to the stylist that she’s got 5 minutes and only 5 minutes. I explain Jonah has autism, and she does her best, quickly fastening the bright-red cape over his head and getting down to business. But soon it’s apparent Jonah’s not having it. We’ve fed him all the candy I bought from the machine and Andy positions himself in front of Jonah, holding his arms, while I promise a lollipop and we start a 5-mnute countdown. “Five more minutes, boo,” we tell him, and then we continue to count as the stylist clips and shaves his sideburns and Jonah starts to intone “all done” over and over with increasing urgency. I can hear the time bomb begin its final loud ticking and sure enough, just as we announce “one minute, almost done,” Jonah launches himself at Andy and out of the chair. Andy rips the cape off his neck and leads him to the entranceway, where they start to struggle. I quickly hand the stylist a twenty dollar bill for the twelve dollar haircut and she disappears, presumably to get me change, and I can feel other clients and stylist’s stares burning holes in my back, but it’s funny how you learn how not to care – so I turn and follow Andy and Jonah out of the store and into the hallway, where the struggle/attack continues and we finally settle Jonah on the bench right outside the glass windows of the haircut place (free show, everyone!) , his head 3/4 cut and 1/4 sheepdog. Later we snipped at his head in the bathtub and now he looks at least passable. I know I am dealing with a system that’s so broken it’s seeing itself in a hundred million smashed mirror pieces, no longer able to glimpse in any whole way how damaged it has become. But I can see it and I know there are others who can too, and I must at least try to do something.